Turns out the answer is bacon. P.S. Looking for more tasty snacks? Check out my Deliciously Different Asian Party Mix. Chop the the bacon into 1/2" wide pieces. Fry until crisp, taking care to not cook too hot and burn the drippings. Set bacon bits aside. Reserve 2 tablespoons bacon drippings. Wipe the pan of any remaining dark bits. Crumble the bacon using a rolling pin (you want it very fine like crumbs). Mix the bacon crumbs with the salt and ancho or chipotle chile powder. Set aside. In a deep pot with a lid, over medium-high heat, add the oil and reserved bacon fat. It should total 1/4 cup. Add the popping corn, and stir to coat. When the corn begins to pop, quickly stir in the sugar, and cover. Delaying the addition of the sugar keeps it from burning. When it's popping rapidly, reduce heat a bit (again to help prevent burning). Lifting the lid to let steam escape will result in crunchier popped corn! As the corn pops, shake or stir often. Remove from heat when the popping drops off. Add to a very large bowl to better coat the popcorn. Sprinkle the popped corn with the bacon, salt, chile powder mixture. Enjoy! All popping corn is not equal. 😀 Orville Redenbacher's and Bob's Red Mill are two that pop very well. We didn't miss the butter (because of the flavor from the bacon fat). 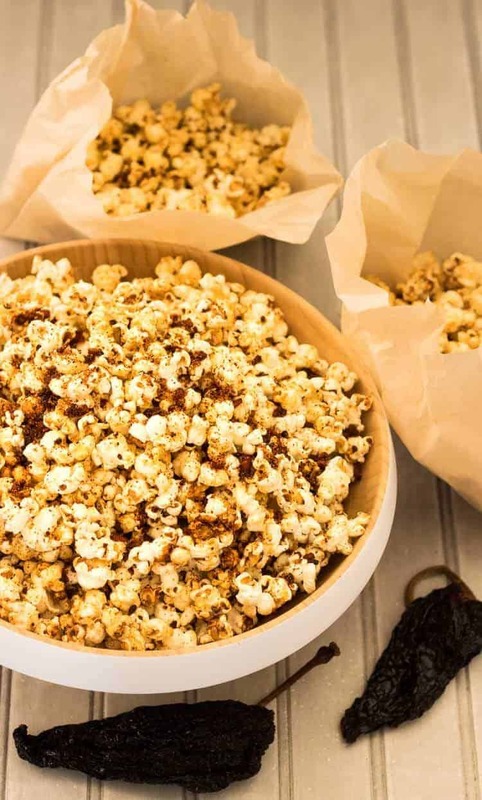 If you can't live without melted butter (or want to improve the adhesion of the seasoning mixture), heat a couple of tablespoons in that hot pan after dumping the popcorn into a large bowl. Lifting the lid occasionally to release the steam will yield crunchier popped corn. Using a light weight pan and tossing it occasionally also prevents burning and facilitates better popping. My most often spoken statement related to a healthy diet without eliminating any food(s) - Everything in moderation. :) Like you, I without that and bacon, I would go nuts!! Awesome popcorn!!!!! 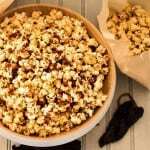 I put chile powder on popcorn all of the time, but never bacon. Oh my...what have I been missing? You're a woman after my own heart MJ <3 Isn't everything better with bacon? Oh my god. I am dying over there. I am a popcorn crack-head (can I say that?) and these flavors are sending me over the moon right now. I better not continue with my crack line of thought here, but you get the idea - these is awesome!